Time seems to slow down in Old Town Helena. Repeatedly throughout the day, a long line of cars forms along Main Street, waiting for the passing train. The sound of the train crossing bell intermingles with the rushing waters of Buck Creek, where kids splash in the water on hot, sunny days. Ladies stroll along Helena Road, shopping the main street’s charming boutiques and chatting with the equally charismatic and engaging shop owners. The gentle babble of conversation and laughter is heard spilling forth from the covered patios of the town’s thriving eateries, where the kitchens crank out down-home deliciousness and the stages host live music acts. The town’s Facebook page features news links boasting that Helena is among the state’s happiest places and best suburbs, alongside pictures of firemen rescuing the town’s lost pets. Old Town Helena is the very embodiment of small-town charm. The well-groomed streets feature pleasing pops of color in hanging baskets and planters of colorful flowers. Picturesque Helena Road is the town’s main street. Helena Road intersects with the railroad, shown here at the nexus of Old Town Helena. The hardworking chefs, stylish shop owners and local artistic talent of this vibrant village shine a little brighter when the town holds one of its nearly weekly special events. “Just about every weekend, the city does something. It’s always exciting. There’s always some family-oriented event to look forward to,” says Lori Tatum, owner of Oh My Sole boutique. “That’s why I chose to open my business here, because there’s so much foot traffic and so much going on.” Experience the bustling evenings on First Fridays, when food trucks, a kids’ zone and live music accompany extended local business hours, or take in live jazz or an al fresco flick with friends and family at the Old Town Amphitheater. Or watch an army of rubber ducks compete to win the famous Duck Race at the annual Buck Creek Festival, where you can also shop local vendors, enjoy live tunes and savor some tasty eats. This restored train car serves as the welcome center for the charming town. The Helena Museum is open Saturdays, or you can call to schedule a free tour. “I was raised in Helena, and I love our quaint little town,” says Kimberly Ford, owner of Skull Girl Soaps. “It is calming and relaxing. Old Town Helena made a great match for my little soap shop, and the folks are so supportive!” It takes less than 30 minutes to get to this wholesome village, but we’re giving you a virtual sneak peek! Let’s explore the boutiques, shops and eateries of Old Town Helena! Oh My Sole shop owner Lori Tatum had been an account executive at AT&T for 17 years when she got a call on December 22 that her position had been cut and she had until February 10 to find a new job. “A boutique was something I always wanted, so I think that short time frame forced me to take that leap of faith,” she says. “I signed the lease on February 11. I knew I wanted to offer shoes. I was driving along listening to Matt Redman’s song, ‘Bless the Lord, O My Soul’ and I just knew!” Oh My Sole began as a shoe boutique, offering many brands that aren’t found anywhere else in the area, and has expanded to include a clothing line that now outnumbers the shoes. A gorgeous collection of jewelry, handbags, accessories and gifts are peppered throughout the shop, as well as YETI items. Oh My Sole specializes in monogramming, so many people get their bags or YETI items monogrammed as gifts. “I love the one-on-one relationships the most,” says Lori. “Ninety-five percent of the time, we know the people who walk in the store by name. It’s like a big family reunion in here every day.” Husbands will come to the shop looking to get a birthday or anniversary gift, and the staff knows exactly what the wife would want. Oh My Sole even held a Valentine’s “For Men Only” event, where Lori and her husband played host and helpers to local men in choosing the perfect Valentine’s Day gifts for their sweethearts. “We offer a lot of brands that aren’t anywhere else in this area, such as Bedistu, Chocolate Blu and others,” says Lori. Oh My Sole carries a terrific collection of jewelry and is an exclusive retailer of local jeweler Surrender, which makes one-of-a-kind pieces. Helena Mercantile owner Amy Webb has watched Helena’s Main Street grow and blossom since she opened her boutique in 2012. From hippie chic and casual looks to outfits perfect for an elegant evening out on the town, Helena Mercantile offers a diverse collection of clothing, shoes and accessories, as well as gifts that your besties will love. And with the laid-back atmosphere, friendly and helpful staff, shabby-chic interiors and budget-friendly prices, it’s a shopping experience that will keep you coming back for more! Find cute summer tops and sandals at Helena Mercantile! Skull Girl Soaps‘ shop is pretty in pink! Polka-dotted onesies, adorable stuffed animals and beautiful christening gowns are gorgeously displayed against the rustic, reclaimed wood and twinkle lights of this unforgettable boutique. It’s the perfect spot to find an adorable baby shower gift or a present for a friend — at wallet-friendly prices. With a fabulous selection of baby and children’s clothes and accessories, women’s apparel, lovely vintage furniture and fun gifts, Beka’s Boutique is a must-visit. Adorable children’s items abound at Beka’s Boutique! 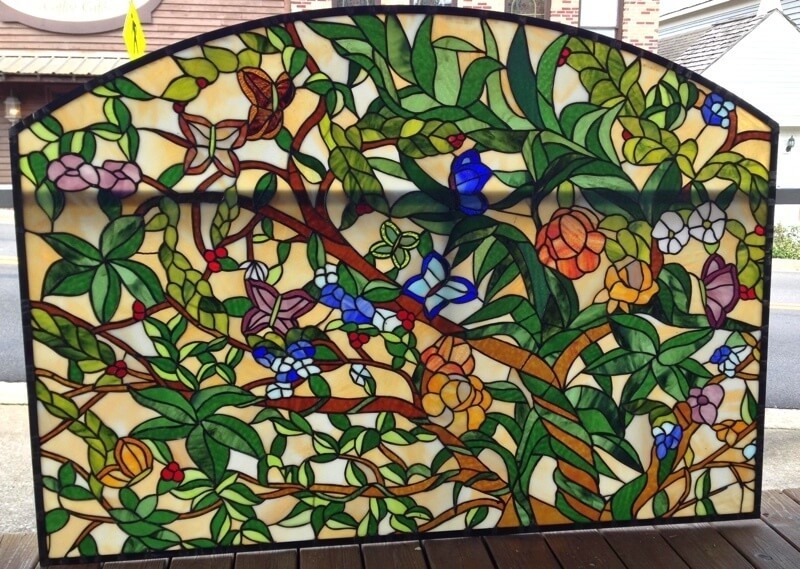 “When I was a kid, I walked past a shop much like mine, and I used to go in and watch,” says David Schlueter, owner and artist of Buck Creek Stained Glass. “I told myself that one day I’d learn how to as well. When I was older, I had the time to take classes, so I did, and I eventually wound up working for the studio.” David offers custom leaded glass and leaded glass repair, Tiffany-style creations, glass-blowing and more. Aside from custom, commissioned stained glass designs, restoration and repairs, David’s classes are among his most popular services. Situated right next to the tracks and not far from the Old Town Amphitheater, David’s studio is set in the center of the town’s constant flurry of activity, and he likes it that way. As he puts it, the “friendly folks” are his favorite part of Helena. The Ivory Orchid boasts a carefully curated selection of women’s clothing, accessories and gifts, such as playful notepads, vibrant coasters and napkins, frames and hand towels. The women’s apparel includes a smart selection of basics that every woman needs for stylish layering, as well as lovely dresses and tops for regular and plus sizes. No matter your body type, you’ll leave The Ivory Orchid feeling ever-so-stylish in your flirty, elegant or boho-chic threads. There is truly something for everyone at The Ivory Orchid. A casual tee is paired with a unique beaded, tassled necklace for a one-of-a-kind boho look! This sprawling restaurant and event space features a large main dining room and bar, side dining room and lounge with a smaller bar, private dining area, event space with a private bar room, screened-in back porch and upper-level deck dining area — each gussied up with touches of modern art mixed in with vintage treasures, against a backdrop of repurposed wood and rustic accents. The charming space is made even more vivacious with the constant live music, such as Sunday’s jazz brunch, featuring tasty mimosas or the Bloody Mary bar; Wine Down Wednesdays; Thirsty Thursday; First Friday and Trivia Night! The bar in the great dining room is situated near the entrance of the restaurant. Soak in the sun as you dine at The Coal Yard. If you’re feeling in the mood to lounge, The Coal Yard has got you covered! Owner Matt Bisaot bought the Depot Deli & Grill in 2003. Beloved by locals, this waterfront train-car-turned-deli-and-grill plays host to hungry kids and families, business meetings, handymen grabbing a quick bite and local shop owners. All walks of life can be found on the covered back porch savoring the ever-popular hamburgers and Philly cheesesteaks, as well as the phenomenal view of Buck Creek. And inside the often-packed eatery, local memorabilia and kitsch decorate the walls, which are covered in dollar bills from customers from the past 13 years. In their first year of business, an employee named Hannah went to McGuire’s Irish Pub in Destin with her family and returned to work asking if she could hang a dollar bill on the wall, mimicking the beach eatery’s tradition. Before long, dollar bills covered the walls of the tiny train car. Nestled in the heart of Old Town Helena, The Depot offers the quintessential small-town dining experience. Kitsch, memorabilia and dollar bills create the singular design aesthetic of The Depot Deli & Grill. The patio at The Depot Deli & Grill overlooks Buck Creek. “We have been in business for 19 years, and the last four have been in Helena,” says Tammy Casteel, owner of Papa Saia’s. This pizzeria and sports bar is the other waterfront eatery in Old Town Helena, and its large, partially covered deck patio is nestled among a canopy of trees, giving it the feel of a treehouse. Papa Saia’s offers live music three to four days a week and hosts three crawfish boils a year. “The city is so welcoming to new people and businesses,” says Tammy, whose favorite part of being in Helena has been meeting new people and the family atmosphere. Enjoy the beautiful view, live music and a glass of wine after a day of shopping, or chow down on some of their popular seafood dishes, wings or pizza. The partially covered patio at Papa Saia’s overlooks Buck Creek through a gentle tapestry of leaves. The uncovered portion of Papa Saia’s porch features long, communal tables. This little smokehouse situated along the train tracks fires up the BBQ pit Thursday through Sunday for some truly delicious barbecue. As they say on their website, “Great BBQ reminds us of family, friends and good times,” and you’re sure to have fond memories of Lazy Boy BBQ after tasting their succulent pulled pork, ribs, chicken and wings, as well as their tasty sides. And don’t forget to taste their famous BBQ nachos with barbecue pork or chicken, nacho cheese, queso fresco, jalapeños, sour cream and barbecue sauce. Take a day trip to Helena and enjoy a refreshingly slower pace as you shop the boutiques, explore the natural beauty of Buck Creek Park and savor a bite as a slow train passes through town!